Wesley E. Etheridge Sr., is a retired Commonwealth of Virginia Disabled Veterans Outreach Representative (DVOP) and US Navy Master Trainer (MTS). He is a graduate of San Diego City College with a Degree in Alcohol, Tobacco and Other Drug Studies. He is the Principal Consultant for GCS Facilitators and Consultants of which he is a Diplomate Certified Anger Management Facilitator (DCAMF). Wes is the author of Manage Your Anger in 10 Days (eBook on Amazon.com) and Co-author of My Final Re-spot which is available in both hard and paperback on Amazon and Barnes and Noble. Wes is a past recipient of the M.K. Gandhi Institute for Non-Violence and it’s Community Leadership Award. Additionally, he has also received numerous other awards for community service in the US. An international platform speaker, he is known nationally as an advocate for military veterans and their families in addition to being known as the “Leading Authority on Military Veterans and Anger Management.” A man with a plethora of experience and knowledge, he is the former Executive Director of two Community Based Organizations, a former Alcohol Substance Abuse Program Facilitator (ASAP) for the Commonwealth of Virginia, as well as the former Veterans Green Jobs Coordinator for the Commonwealth of Virginia. Other past experiences include; Commonwealth of Virginia Volunteer CASA, California Gang Diversion Specialist, Arizona Youth Corrections Behavioral Coach, Connecticut Adult Correctional Re-entry Coordinator and NJROTC Instructor. As a passionate entrepreneur, he is a full time Anger Management Train the Trainer and advocate for veterans on Capitol Hill. However, he continues (when he can) to actively assist veterans and others with managing their secondary emotion of anger, especially those who exhibit maladaptive behaviours or characteristics associated with acute and chronic anger. Survivors of the January 15th 1978 mishap believe that what happened on that evening was one of the greatest cover up’s in US Naval Aviation history. But what really happened on that tragic evening when the FID was on Sea Trials off the coast of St. Augustine, Florida? History and eye witness accounts reveal that unbeknownst to the Ship’s Company and Carrier Air Wing Seventeen personnel that they would become participants of the second worst documented aviation mishap on the flight deck of the USS Forrestal CV-59. Our story is literally unknown. 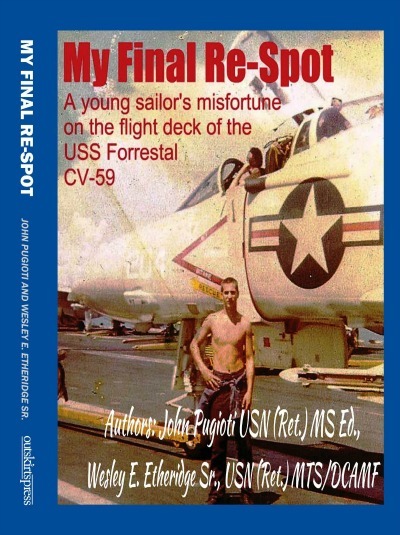 It’s a contrast in the directions of the authors of this book, two U. S. Navy veterans, John Pugioti and Wesley E. Etheridge Sr., who at the very young ages of eighteen and nineteen both where on the flight deck that evening working as a team of two, as Fly-3 Blue Shirts. Ultimately, the mishap that occurred that evening, would exponentially dictate the direction of both young men’s lives forever. In essence, it would be their “Final Re-Spot” together and the last time they spoke or saw each other, until thirty-six years later.